I’ve mentioned this before on this blog, but I’m someone who has historically been afraid of new things. Change has always scared me a lot. I’ve let my fear hold me back from new experiences. Over the past few years, I’ve pushed myself out of my comfort zone a lot more and have been able to challenge myself to experience new things. One of the biggest ways I have found to challenge myself over the last several years has been through this blog. I’m not a social person, so talking openly on the internet where anyone could read it scared me a lot. 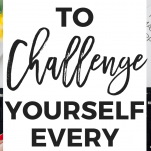 Finding new ways to challenge yourself is so important! There are so many opportunities to do so that we let slip by. 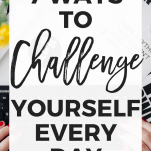 I want you to challenge yourself, so I’m sharing a few ways you can challenge yourself regularly, and I promise you’ll be glad you did! I have always loved reading and learning, so this one isn’t difficult for me. It might be for you though, and that’s okay! I would challenge you to learn something new each day. Maybe it’s learning a new trick you can use to improve your blog, or maybe it’s turning on the news and learning about something that’s going on in the world. It could be a new recipe. It could be a new hairstyle. Or even a new style of food you’ve never tried before. Whatever it is, choose to do something that pushes you a little out of your comfort zone. It’s amazing the feeling of satisfaction you can get from trying something new for the first time. This is one I really struggle with. I sit at a computer all day at work, with my phone nearby. I come home evenings and weekends and sit down in front of my computer to work on blog stuff. And when I’m just hanging out and watching TV, I still find myself mindlessly scrolling on my phone. But every once in a while I get the urge to unplug and read a book or get something done around the house. Seriously, it’s moments like those when my home reaches it’s cleanest, or when I actually manage to clean out my closet and get rid of things I haven’t worn in three years. It’s also a great opportunity to focus on family, pets, or get a drink with a friend you haven’t seen in a while. This is a big one for me, something I really strive to do regularly. My blog/business has changed so much over the last several years, and I love challenging myself by creating new goals. This is something you can apply in any area of your life! It can be a goal for your career, your relationships, your home, or just yourself. Try reaching out to someone you admire in your career and ask them to be your mentor. 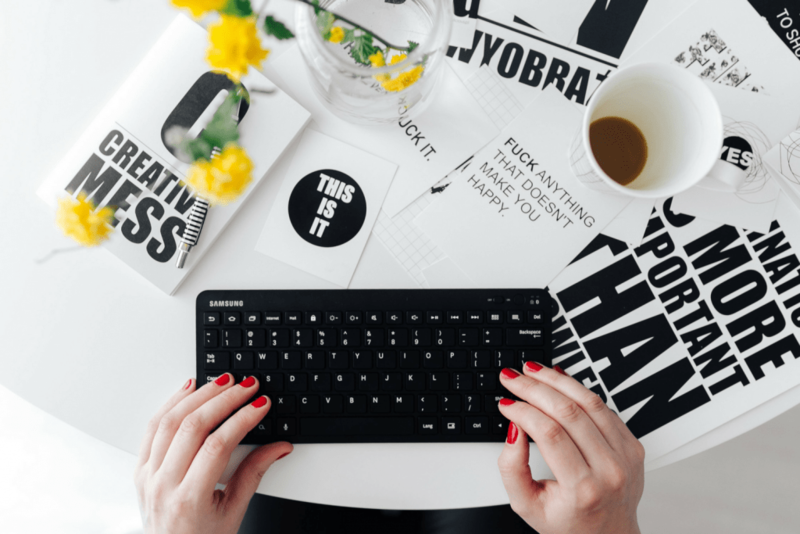 If you’re a blogger, reach out to a blogger you really admire and ask if they’d like to collaborate with you, or even if you can just pick their brain. Making friends with bloggers more experienced than me has been an amazing way for me to grow my blog! A mentor is a beneficial tool in any career field. Doing something awesome for another person or making their day is the absolute best feeling. When you think of something you can do for someone else, you might immediately think of volunteering or donating to a charity. And those things are awesome, but they aren’t the only ways to do something for someone else! It can be as small as holding the door open for something else or helping someone carry their grocery bags to their car. Keep your eye out for those small opportunities to make someone else’s day better. This might mean booking a vacation to an international destination you’ve always wanted to visit. But it also might mean trying a new restaurant in town or heading to the local piano bar you’ve always eyed curiously from outside. One of my favorite things about Madison is that there are SO many cool things to do, and I’ve really enjoyed exploring them! Visiting a new place might also mean taking a day trip to a nearby town. Do a little research on some surrounding towns and cities, because I guarantee there is something to see! I would LOVE for you to leave me a comment and let me know what you’ve done lately to challenge yourself! This is a great list! I’m kind of from the same No Change is a Good Thing camp as you. I’ve learned to enjoy challenging myself, especially through food, a lot in the last several years. Food is one of my favorite ways to try new things 🙂 I’m up for trying anything when it comes to food! Thanks Diana, that’s absolutely true! I can relate perfectly to this list! for the past couple weeks I’ve been setting goals and thinking of habits I need to pick up, and yesterday I just decided to DO them. And I did and it was great; I’m going to do the same routine tonight. It’s just crazy how long it took me to realize Nike was right, you just have to do it:) it’s sad how much we delay things and hold ourselves back. Trying something new is an excellent way to challenge yourself. 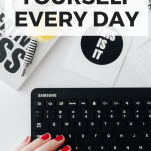 I feel like I am doing that all the time when it comes to blogging! That’s so true. I feel that way a lot as well. I love these! They sound like great ways to really make a change in your life. This is really good. Regular small challenges are how we build up those ‘muscles’ in order to take on the bigger ones life throws at us! This is a really awesome and practical list, Erin. It’s perfect. I really need to get out to new places – even if it’s just a new coffee shop to blog for a few hours. I’ve been wanting to for awhile, but sometimes I just get nervous to do some things alone. I need to push myself more! I love that! I definitely want to start getting out of the house to blog, and a coffee shop would be a great option! It always feels so good to unplug! These are all great tips! That’s something Dave and I definitely need to work on! But every night we try to spend some time just the two of us watching our favorite shows together, and rarely sit on our phones at that time! I 100% love this! I love the doing something for someone else. THat always puts me in a good mood! I agree! It’s something people forget to do a lot, but such a great feeling! My two favorites are to try something new and to unplug to actually do something new! I’m always so proud when I try a new recipe or craft and it turns out great! I’m so productive sometimes too when I just put down my phone and clean something or work on something around the house. This is such great encouragement that even little things can be great ways to challenge yourself…it doesn’t have to be anything crazy! I could definitely stand to unplug more often as well! That would be such a fun idea! I should add that to a list of things to try in 2017! 8m one of those people who Ararat feeling restless and stagnant of I’m not doing new things – that’s why I’m always experimenting in the kitchen or reading a new book. I’ll admit I do really have a problem getting unplugged, especially during the week. On weekends I’m usually busy with a project and I will go hours without phone/tv. Wow at the typos…. that was supposed to say: I’m one of those people who start feeling restless! That’s awesome! I wish I was more motivated when it comes to taking on new projects! Unplugging is the hardest thing for me to do. Working at it every day little by little, and it seems to be helping so far! I totally agree! That’s one of my hardest as well. I love this list! I am definitely not a fan of change. Change gives me anxiety. But Brad and I have been stepping out of our comfort zone lately and traveling to a new town to try a new restaurant. Some we love and some we hate but it makes conversation and memories.